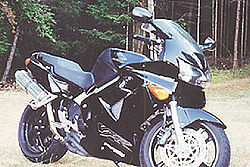 VF500F Interceptor, a.k.a. "Babyceptor," with custom paint job. 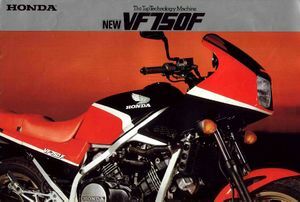 The VF and VFR series motorcycle was a breakthrough V-type four cylinder engine design from Honda resulting in a popular street bike. This stems from a combination of a relaxed riding position, excellent power, minimal vibration, and bulletproof design. The V-Four engine was very prominent in Honda's early 1980's model line-up, with the Interceptors, Magnas, and Sabres. The V-Four design had only been used a few times in the history of motorcycles, most notably by Matchless. The concept probably came about as a loose derivation from the NR500 oval pistoned V-Four racer. The earliest VF series engine was designated the V45 for its size (45 in³ or 748 cc), was very narrow being only 16 inches (406 mm) wide, and had perfect primary balance making for a smooth, vibration-free engine. A smaller V30 (500 cc) engine and a larger V65 (1100 cc) engine were also available, the latter becoming known as the fastest production bike in its time, and the original competition for the famous Yamaha VMax. In 1982, first year of the VF models, reliability problems abounded due to new automated production equipment at Honda's plant in Hamamatsu, Japan . Regardless, Honda sold out its first year inventory of Sabres, and the Magnas were not far behind. 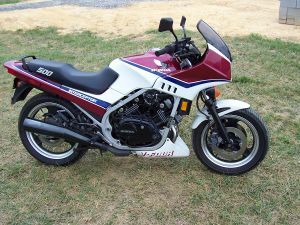 1983 was a new year and a new start for the VF series of bikes, seeing the engine revised to correct the problems from the previous model year, and saw the introduction of the V65 and the Interceptor. 1984 was the year the infamous cam problem surfaced, which, by the time it was corrected, led to eight cam revisions over the course of one year. The cam chain was later dropped from the VFR in favor of gear driven cams, to help distance the VFR from the reputation of earlier VF engines for premature cam wear. As the cam-wear problem faded into history, 2002 and later VFR engine designs have reverted to chain-driven cams. The RC30 was the successful racing version, replaced later by the RC45. In 1998 the VFR750 was replaced by the re-designed VFR800Fi, with a displacement of 788cc and Fuel injection. In 2002 Honda released the VTEC version, which dropped the gear driven cams. The VTEC is different from the technology used in Honda cars, where the valve timing varies. On the 6th generation VFR, below 6,800 rpm, two valves per cylinder open and close, resulting in greater fuel economy and lower emissions. Critics, however, say this robs the engine of some of its power. Above the 6,800 rpm, the VTEC valves kick in, four valves per cylinder operate. Some critics say that the transition from one mode to another is not smooth, creating a jolt which can be unsettling if it happens mid-corner. Pages in category "Honda VF and VFR"
This page was last edited on 16 June 2010, at 15:11.